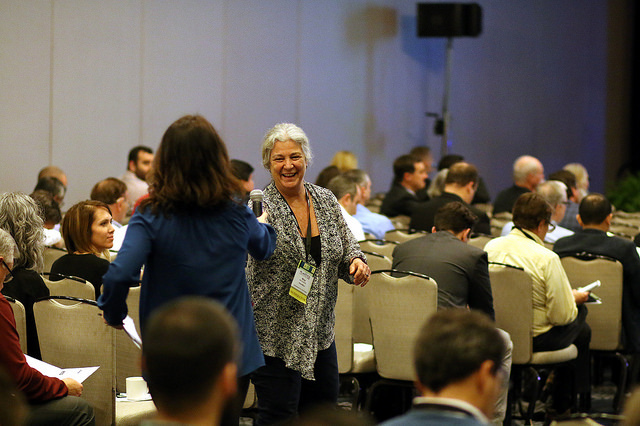 Over the past two weeks, GreenBlue and SPC Director Nina Goodrich has been flying across the U.S. to speak at two major industry conferences. 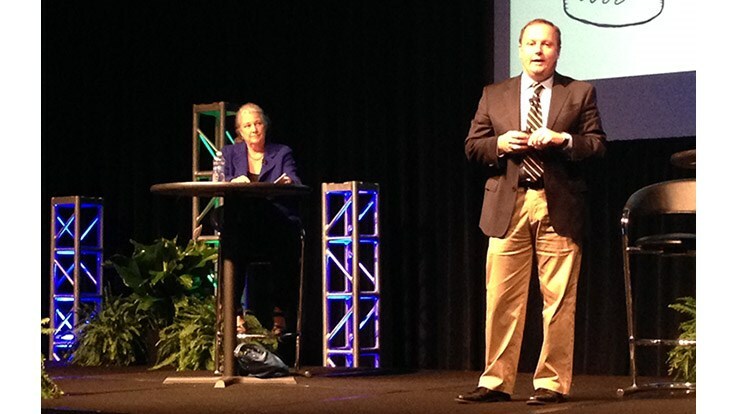 First was the 2016 Plastics Recycling conference hosted by Resource Recycling in New Orleans, Feb. 1-3. Nina moderated the session “The Economic Upside of Recycling” with speakers Keefe Harrison (The Recycling Partnership), Joe Pickard (Institute of Scrap Recycling Industries), Tim Buwalda (Reclay StewardEdge), and Paul Yang (Mother Parkers). The session focused on the opportunities that the sustainability community has in the current challenging recycling market. During the session, Nina also introduced our newest initiative ReStart the Cycle, a coordinated effort to increase the recycling of valuable materials. While materials like PET and HDPE are recyclable in over 60% of communities and very valuable to MRFs, there is still a large amount of these materials that don’t make it to MRFs. ReStart the Cycle will encourage the use of the How2Recycle label on packaging that are of high value in the packaging value chain. Read the full Recycling Today coverage of Nina’s Plastics Recycling session. 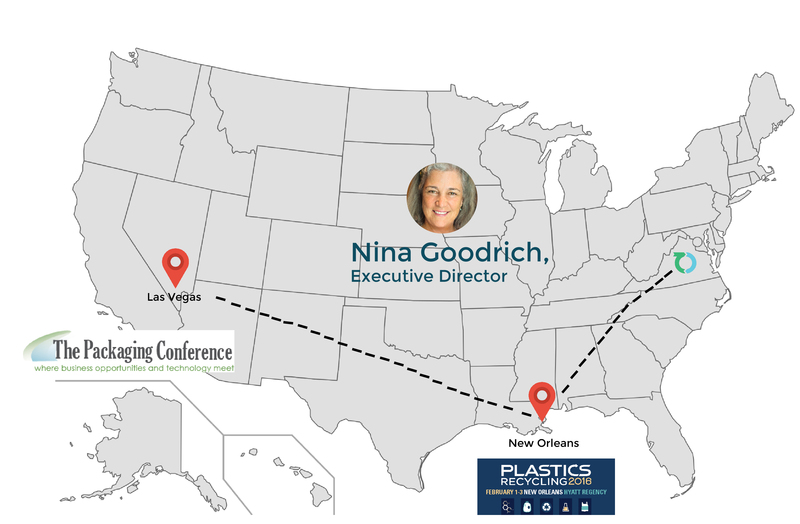 At the Packaging Conference on February 8-10 in Las Vegas, Nina explored the State of Sustainable Packaging in 2016. Key challenges discussed include: The price of oil and the effect on the economic viability of recycling, the global resin surplus and the China green fence. Opportunities include the increasing acceptance of the circular economy, COP21 and EPA’s food waste reduction goals. 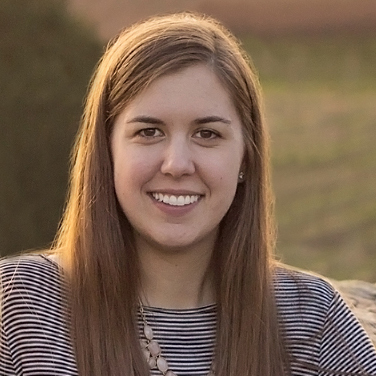 In her talk, Nina also touched on the current Sustainable Packaging Coalition initiatives including an exciting project that is set to be unveiled later this year. The Goals Project has examined over 150 companies’ goals as they relate to sustainability issues and will be analyzing the trends that can be seen among these Fortune 500 companies. Follow @GreenBlueOrg or join our mailing list for the latest news and updates about GreenBlue and the SPC.